It seems the person most annoyed at Roy Hodgson’s appointment as England manager was Daniel Levy – the Spurs chairman now forced into handing over compensation to Harry Redknapp when he could have been on the receiving end if the FA had opted for “The People’s Choice”. Not wholly accurate, a better choice of phrase may be “The Media’s Choice”. Redknapp is a polarising figure, with as many people suspicious of his cheeky cockney persona as loving it. 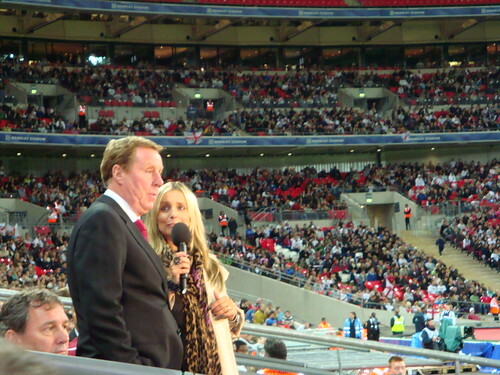 Despite being found not guilty on corruption allegations, there remains a lingering sense that there is something untrustworthy about Redknapp. The main thing seems to be that he is not a stupid man, but attempts to pretend that he is. The wilful ignorance when talking about another team’s player; the tidbits to the media. They create an aura of honesty to those who like him, yet to those who don’t it just seems manipulative. Many of the more honourable (most of whom are notably foreign) managers get pulled apart in the media, but Redknapp is given support far beyond his ability. Despite having won just one trophy in his entire career, he was hyped as a better manager than Fabio Capello, one of the greatest in history, destined to usher in a new dawn of exciting and attacking football as the English saviour. The result is that he doesn’t get the credit he deserves from those who don’t buy into the hype, because he is over-credited so much by a media who do nothing but prove how unfit-for-purpose and sycophantic they are with every mention. His apathetic attitude to the falsely intellectualised area of tactics has been parroted by those who like to wear their ignorance as a badge of honour and is met with derision by those who do take an interest in the subject, yet he remains a decent tactician. He is very good at getting the best out of his players, adapting his side to fix things that aren’t working – where he mostly fails is when he has to react to the other team, which can be a major issue when that other team is a better side than Spurs, resulting in thrashings at the hand of several of the other big clubs. He is primarily a proactive manager, which is good in theory but not guaranteed to be in practice. Although he has expressed his dislike for his wheeler dealer reputation, there’s no denying that Redknapp is very good in the transfer market. The label might make him seem a bit small-time and its associations do little to help the suspicion with which he is treated by many, but, in a footballing context, it is undoubtably positive. Redknapp is an excellent talent-spotter – the number of successful transfers far outweighing the flops – which has allowed him to get away with some of his tactical problems: by buying better players, his team becomes better and forces the opposition to adapt to them rather than the opposite way round. Nevertheless, it’s difficult to ignore what has been an issue with his dealings: he just buys so many players. Established players like Sebastien Bassong, William Gallas, Niko Kranjcar, Steven Pienaar, Carlo Cudicini, Stipe Pletikosa and Ryan Nelsen have all been bought in to warm the bench, while Wilson Palacios, Peter Crouch and Robbie Keane were all pushed on quickly. It’s difficult not to think a major reason Levy’s opted to let Redknapp go is so he doesn’t have to part with large amounts of money for players who may just play bit-part roles and leave in a season or two. Initially, however, Redknapp could not use his ability in the transfer market when he arrived at Tottenham, taking over in late October. The “two points, eight games” mantra was recycled so much that it became something of a joke, but Redknapp did do brilliantly to pull Spurs out of their freefall immediately. Even so, Juande Ramos wasn’t totally to blame – after all, he had pulled them out of their funk the year before when Martin Jol was pushed out, and won the League Cup. Spurs then decided to completely alter their squad over the summer, bringing in Luka Modric, Giovanni Dos Santos, Heurelho Gomes, David Bentley, Vedran Corluka and Roman Pavlyuchenko to replace Dimitar Berbatov, Jermain Defoe, Lee Young-Pyo, Younes Kaboul, Steed Malbranque, Pascal Chimbonda, Paul Robinson, Teemu Tainio and Robbie Keane. Such a quick change in personnel is difficult to implement quickly, undoubtably playing a role in Spurs’ troubles at the start of the 2008-09 season. Modric has been the only roaring success of those summer arrivals – Corluka and Pavlyuchenko’s success debateable – and even he struggled to adapt at first. Ramos attempted to play the 4-4-2 he used the season before, but without the Keane-Berbatov partnership it didn’t work, so a striker was withdrawn to add another man to the midfield in an attempt to gain some control – it clearly didn’t work so Redknapp was brought in. The major difference he made was how Spurs defended, becoming much more proactive when they didn’t have possession. Rather than sit back and hope to be difficult to break down – which they obviously hadn’t been during the early season under Ramos – they looked to hassle the opposition and win the ball back. A knock-on effect was that this eased pressure on the defenders, especially keeper Gomes, who really struggled to settle into English football. The slight Modric was also pushed higher into an attacking midfield role behind the striker, where he didn’t need to worry about the defensive side of the game so much, until the January transfer window arrived. Buying back Jermain Defoe and Robbie Keane allowed Redknapp to switch back to a 4-4-2, shifting Modric out onto the wing, while Wilson Palacios added greater defensive steel to the centre of midfield. The set-up worked, dragging them up the table, and little was changed until the following January. Gareth Bale had been a horribly unlucky purchase from Southampton in 2007, injuring ligaments in his ankle in his debut season and enduring a morbidly interesting 24-match streak without winning while playing in the Premier League, which only ended with a 85th minute substitute appearance against Burnley over two years after he joined Spurs. However, in January 2010, an injury to Benoit Assou-Ekotto meant he was thrust into the vacant left-back slot, where his driving runs impressed Redknapp. By the time Assou-Ekotto returned, Bale was performing too well to leave out so he was pushed forward into a more natural winger role, with Modric moved into the centre, where Palacios would typically make up for any defensive fragility the Croatian still had. Injuries kept Aaron Lennon out until the end of the season, but the following season he and Bale could team up on the wings. Direct football has got a bit of a poor reputation at the moment due to the popularity of Barcelona’s possession-based game and the ugliness of defensive teams like Stoke, yet Redknapp had Spurs playing an exciting game based on getting the ball forward quickly. Tottenham would harass the opposition until they got the ball back then knock it out to the wings quickly, where Bale and Lennon would attack, stretching the opposition to pull it inside for the striker. Because they were doing it so quickly, getting extra men forward wasn’t a necessity, but even so the wingers’ willingness to take on defenders ensured opposition defences were stretched. The success of the previous season did however open up new possibilities. Champions League qualification was enough to entice Rafael van der Vaart away from Real Madrid, requiring a change of shape. Redknapp dropped a striker to accomodate Van der Vaart in an attacking midfield position – giving Spurs a different angle of attack, but also crucially making sure opposition midfielders were kept busy, ensuring they couldn’t move wide and help their full-back deal with the wingers. A defensive bonus was also revealed after Spurs were bested by Young Boys in the first leg of their Champions League qualifiers, the typically more patient European game exposing their midfield. Although pretty poor defensively, just having Van der Vaart as an extra man in midfield helped Tottenham gain a footing there by providing an extra man to get past and lessening the space available. Tottenham impressed by exposing Italian teams’ issue with width in the Champions League before falling to the simply superior Real Madrid, but found it tougher at home, missing out on Champions League qualification for the 2011-12 season. Now as an established big team, Spurs were coming up against teams in the league happy to simply settle for a point, meaning a greater subtlely was needed to break them down. They slowed down their game to a more patient passing game – a key element being full-backs Assou-Ekotto and new boy Kyle Walker bombing forward to overload the flanks. The less direct game didn’t necessarily play to Bale’s strengths, so he was moved around, often playing on the right or behind the striker in free roles – he rarely found the consistent form of previous seasons as the direct danger on the left, but the freedom meant he was able to pop up with moments of genius. Chelsea’s Champions League win meant they missed out on Champions League qualification for another year, but objectively it was a good season. Although ending his time at Tottenham trophyless, Redknapp can consider himself hard done by, having created an attractive and talented team that has adapted well to the various challenges it has faced. Nevertheless, unless they make an awful appointment, Spurs don’t really lose much by sacking him. Three similar finishes suggest Redknapp may have taken Spurs as far as he could and with Bale and Modric surely getting harder to keep away from bigger clubs each year, it may benefit him to leave before the stars that are key to his side need to be replaced.